Storage is one of the biggest concerns when living in a small apartment. But more than a challenge, it’s an opportunity to discover your creativity and ingenuity. Ottomans are especially practical in the sense that they can be tucked away under a large table or a shelf when they are not needed. You can also play around with your coffee tables and corner desks that have storage space underneath. Adding a stylish table skirt can be a quick fix solution for your storage needs while also maintaining your home aesthetic. Closets typically don’t require the same level of privacy as bedrooms or bathrooms, so consider their doors expendable. Try a curtain instead and gain the space that a door would have required for swinging open. Bathrooms usually accommodate just one person at a time. So why not maximize the extra floor space by adding a towel cabinet? You’ll free up space in your linen closet this way, so that’s double the advantage. If you feel like adding dividers to define boundaries around a studio or open floor plan apartment, bookshelves are a smart choice. Go for open-styled shelves for a more aesthetically pleasing effect. One of the best things about living in San Francisco is that it’s easy to bike around to your every destination. The catch: you’re often scratching your head about where to park it. Fortunately, wall-mounted bike racks are easy to find these days. 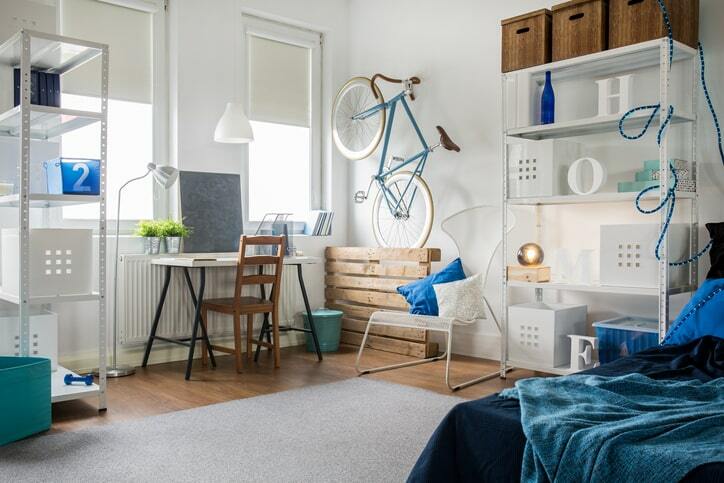 Not only is this space-saving, it also makes your bike a defining piece of personal décor in your pad. Using wire baskets and peg boards, walls and doors can become multi-purpose storage solutions wherever they might be located in your apartment. For the bedroom and bathroom, these can come in handy for hanging clothes and towels, or perhaps a toiletry rack. In the kitchen, you can use the backs of the cupboard doors for storing condiment bottles or small cooking utensils. Notice a tiny space between the end of a cabinet and the edge of the doorway? Adding narrow shelves will be a practical and charming addition to what may otherwise be an ignored space. If it’s in the kitchen, use the shelves to display your cookbooks and showcase your culinary flair (or attempts to develop them, at least). This last one isn’t strictly a storage tip, but it’s a fun little hack you can try if your place feels a little cramped. If you have large cabinets or perhaps a foldaway bed, install a large mirror on the blank front. The mirror will visually expand the space and maximize the natural light that enters your apartment, making it feel roomier than it actually is. For the best leads on San Francisco homes, condos, and apartments, contact Ray Amouzandeh of TARGA Residential Brokerage. Call 415-494-7009 or email SFHomez(at)gmail(dotted)com today.